A Lot to Say’s baby blankets are so soft you’d never guess they’re made from 100% post consumer recycled plastic bottles. Each made-in-the-USA blanket saves 200 plastic bottles from going to a landfill. The company also uses a no water dye technology which saves hundreds of gallons of fresh water. What’s more, A Lot to Say gives back a generous percentage of their profits to charities including The International Green Energy Council, Global Green, Stand Up to Cancer, Heal the Bay and the Animal Rescue Foundation. The blanket starts with the classic Star Light Star Bright nursery rhyme and includes the cute saying: “In the 6 hours we dream every night we have the power to make our wishes come true.” At 42-inches by 42-inches, this sustainable baby blanket is big enough to place on the floor for your baby to play on or to cuddle under with your toddler. A Lot to Say's baby blankets are so soft you'd never guess they're made from 100% post consumer recycled plastic bottles. Each made-in-the-USA blanket saves 200 plastic bottles from going to a landfill. The company also uses a no water dye technology which saves hundreds of gallons of fresh water. What's more, A Lot to Say gives back a generous percentage of their profits to charities including The International Green Energy Council, Global Green, Stand Up to Cancer, Heal the Bay and the Animal Rescue Foundation. 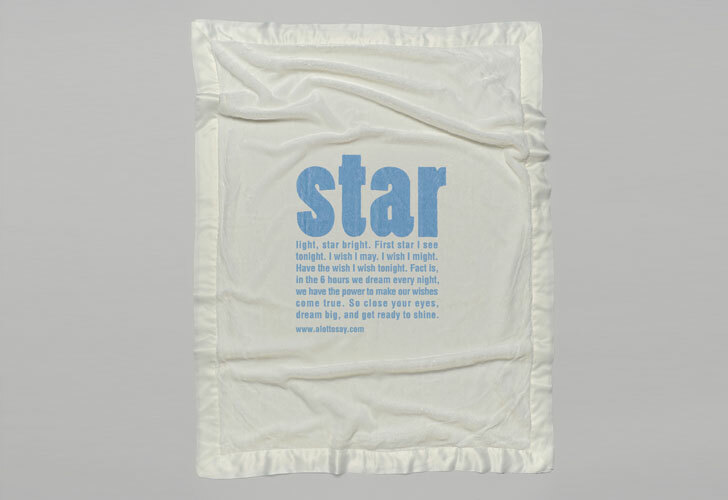 The blanket starts with the classic Star Light Star Bright nursery rhyme and includes the cute saying: "In the 6 hours we dream every night we have the power to make our wishes come true. "�At 42-inches by 42-inches, this sustainable baby blanket is big enough to place on the floor for your baby to play on or to cuddle under with your toddler.